I have biked to and from work hundreds of times, and I love the convenience, the predictability (aside from the one time I got a flat tire, I always knew exactly how long it would take me to get to work and home from work), and the fact that I could combine my exercise in my commute! Since I moved in December, closer to DC, but further away from a trail entrance, I haven’t figured out yet how to get to work by bike (safely, anyway) — hopefully we will get a non-rainy Sunday soon, so that I can walk the route and try to figure it out. But until then, Hugi, my former coworker who ran with me this past Wednesday, has suggested that we run home from work. 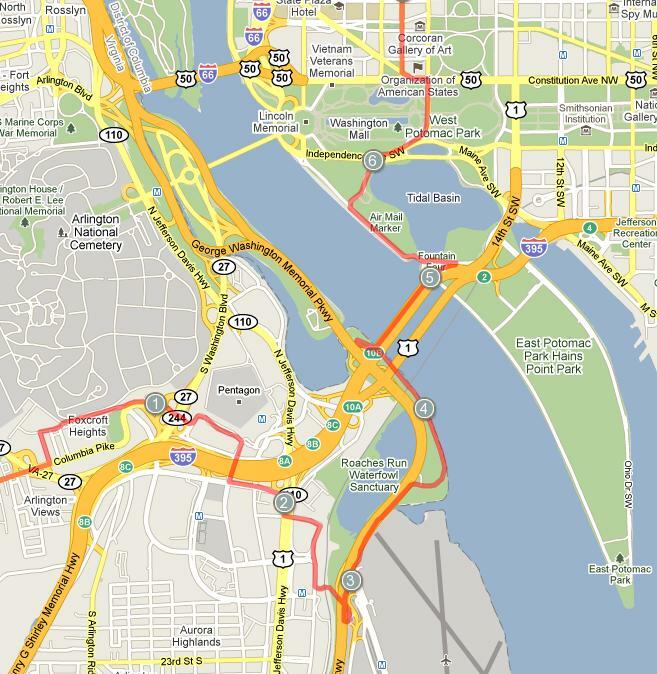 I have mapped out two different routes home — one I take the Memorial Bridge and the trail by Washington Blvd (the one I need to do a test run/walk in, before I bike through it — you can get lost a lot faster by bike). That one is a couple of miles shorter, but no pretty views after leaving DC, since it doesn’t follow the river. I get to my street right by the side of the Pentagon, then pass this horrible uphill on my way to the Air Force Memorial. Hugi would then continue under 395 on her way home. The other route, the one we’re trying out first, is the prettier route, but about two miles longer. We take the 14th street bridge into Arlington, and catch the Mt. Vernon Trail to Crystal City. 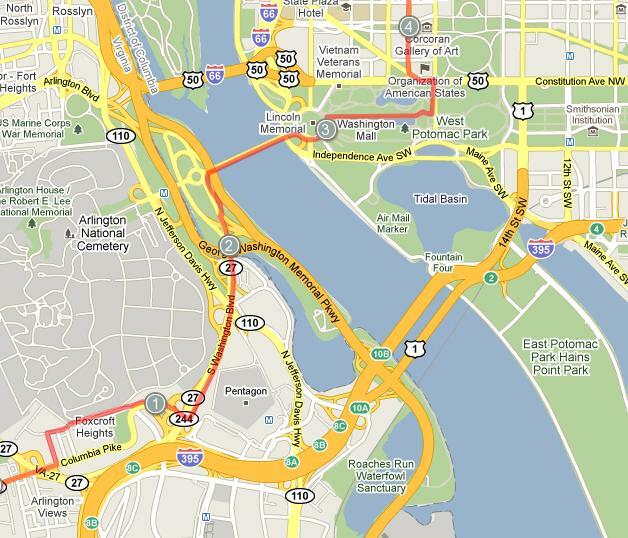 Hugi will stay in Pentagon City, while I run towards the Pentagon and the Air Force Memorial again. See the big half circle we have to make, since there’s no way straight across from the bridge to the Pentagon? We’ll see how it goes, and if we keep up with it, at least once a week. I’ll keep you posted! Have you tried mapping it out with the new google bicycling option? Is that where the maps came from? Tyler, I tried, and it had me going up the exit to Washington Blvd/395 from Columbia Pike — DEFINITELY not a bike friendly option since that’s a tricky merge even for cars, since most people there are going into 395. I got the maps from mapmyrun.com.